September 11 began with a heavy fog, which provided cover for the British troops. Washington received contradictory reports about the British troop movements and continued to believe that the main force was moving to attack at Chadds Ford. The British appeared on the Americans' right flank at around 2 p.m. With Hazen's brigades outflanked, Sullivan, Stephen, and Stirling tried to reposition their troops to meet the unexpected British threat to their right flank. 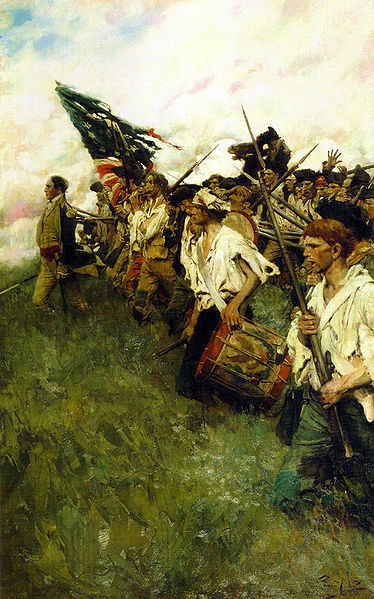 Howe was slow to attack the American troops, which bought time for the Americans to position some of their men on high ground at Birmingham Meeting House, about a mile (2 km) north of Chadds Ford. By 4 p.m., the British attacked, with Stephen's and Stirling's divisions receiving the brunt of the assault, and both lost ground fast. Sullivan attacked a group of Hessian troops trying to outflank Stirling's men near Meeting House Hill and bought some time for most of Stirling's men to withdraw, but returned British fire forced Sullivan's men to retreat. At this point, Washington and Greene arrived with reinforcements to try to hold off the British, who now occupied Meeting House Hill. The remnants of Sullivan's, Stephen's, and Stirling's divisions stopped the pursuing British for nearly an hour but were eventually forced to retreat. The Americans were also forced to leave behind many of their cannon on Meeting House Hill because almost all of the artillery horses were killed. 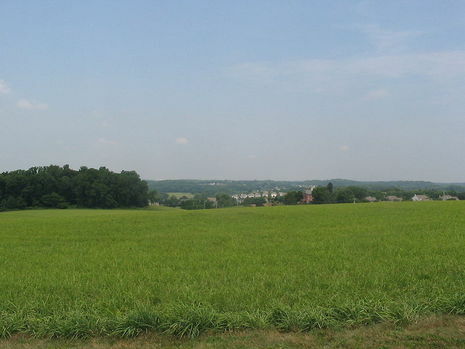 Knyphausen, on the east bank of the Brandywine, launched an attack against the weakened American center across Chadds Ford, breaking through Maxwell's and Wayne's divisions and forcing them to retreat and leave behind most of their cannon. Armstrong's militia, never engaged in the fighting, also decided to retreat from its positions. Further north, Greene sent Colonel Weedon's troops to cover the road just outside the town of Dilworth to hold off the British long enough for the rest of the Continental Army to retreat. Darkness brought the British pursuit to a standstill, which then left Weedon's force to retreat. The defeated Americans were forced to retreat to Chester where most of them arrived at midnight, with some stragglers arriving until morning. 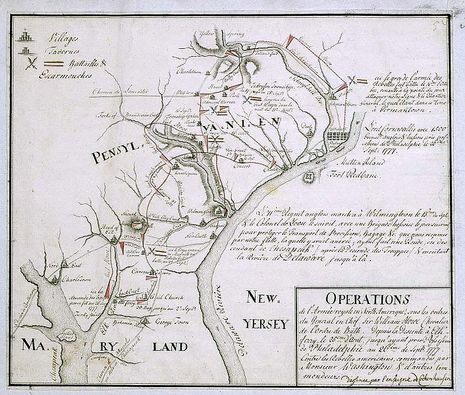 On August 24, 1777, in the third year of the American Revolution, General William Howe with 13,000 British and 5,000 Hessian troops landed near Head of Elk, Maryland, his goal being to seize Philadelphia (Map 1). By September 9, his army was at Kennett Square, Pennsylvania, six miles west of the Chadd's Ford Crossing of Brandywine Creek. Facing him from the east side of Chadd's Ford, about five miles downstream from the point where the creek divides into east and west branches, was George Washington with 11,000 American soldiers. Although dry weather had left the Brandywine shallow, it provided a considerable obstacle. Trees grew thickly to the banks, making it impassable to an army except at the fords. There were, however, no fewer than three of these between Chadd's Ford and the forks of the Brandywine, and another (Pyle's) just below Chadd's. Immediately above the forks, the east branch of the creek was crossed by Buffington's Ford and, a mile and a half farther up, by Jefferis' Ford. Across the west branch, less than a mile from the forks, was Trimble's Ford. The region was inhabited chiefly by Quakers, whose religious views made them neutral. Most local families who favored the American cause had fled. Thus, Washington got sparse information, and much of that was inaccurate-he was told, for example, that there was no ford above Buffington's for twelve miles. Furthermore, the rolling and forested nature of the ground prevented good observation. Washington deployed General Anthony Wayne's brigade and Colonel Thomas Proctor's artillery on high ground east of Chadd's Ford, covering the crossing. General William Maxwell's brigade was moved across the creek to form an outpost line on a hill, blocking the Kennett Square-Chadd's Ford road. General John Armstrong and about a thousand Pennsylvania militiamen were posted to cover Pyle's Ford. 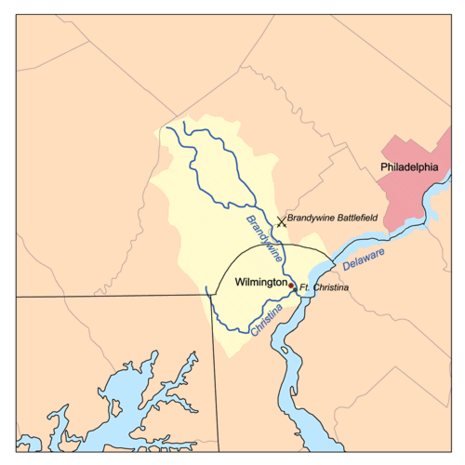 General John Sullivan's division extended northward along the Brandywine's banks. Farther upstream was General Adam Stephen's division, and beyond that was General Lord Stirling's division. Detachments under Colonel Moses Hazen were at each of the upstream fords, up to and including Buffington's. The brigades of Generals Peter Muhlenberg and George Weedon, comprising General Nathanael Greene's division, were in reserve behind Wayne. With them was most of the light horse, under the Polish volunteer, Count Casimir Pulaski. Other light horsemen were sent to scout west of the Brandywine to report any British movements. Perhaps with Tory help (Joseph Galloway, a prominent Philadelphia loyalist familiar with the region, was with the British), Howe had better information than Washington. Instead of a head-on attack against prepared defenses, he planned a wide flanking movement. One part of his army would advance on Chadd's Ford in a demonstration to preoccupy Washington; the rest, screened by hills and woods, would march north, cross the creek's west branch at Trimble's Ford, cut northeast to Jefferis' Ford, then turn southward to drive down on the Americans. As if to favor Howe's maneuver, heavy fog blanketed the area when the flanking column began its march early on the morning of September 11. Howe took the lead, heading a force of 13,000 British and Hessian troops.